Hello all, I made the following program which searches for all occurrences of a list of keywords within another string. It seems to work fine, but I ask for suggestions to make it faster (without using assembly). dim as string searchText = "BlablaxxxThreadCreateyyyAbsxxxYearyyyMoretextAbs! ?randomtext!absABS"
Last edited by badidea on Jan 05, 2019 11:36, edited 1 time in total. Here are in BASIC and Assembler it's ultra fast ! How long it search for 10,000 keywords on your box ?
' print " not found must be an error !" print "searched " & nSearch & " keywords in " & tEnd & " seconds !" On old laptop searching 1,000,000 keywords in under one second 0.9204567447304726 !!! However it's fast enough to do syntax highlighting in real time. on top of the file to enable BASIC only. I added one more test to be sure all CRC32 checksum's are really !!! unique !!! print "build CRCtable for " & nKeywords & " !" print "be sure no two or more diffrent keywords share the same CRC sum !" print "sorry CRC32 isn't the right solution !" print "looks fine all CRC checksums are unique !" I don't understand. Which is the text to be searched? Made the searchtext about a million characters by doubling up. print "Press a key for the positions in the string"
Last edited by dodicat on Jan 06, 2019 14:57, edited 1 time in total. but you mean InStr() what is wrong with InStr() ? What is the sense of this input string ? I mean a programming language is a collection of tokens and tokens are separated by delimiters. With other words what you are doing or what is the source of your blabla text without delimiters ? Why do you search PartString in SomeString two times in function TALLY ? print "found " & keyword & " " & count & " times"
Twice in tally, to get the array dimension first time and fill the array with the positions the second time. Last edited by dodicat on Jan 05, 2019 3:18, edited 1 time in total. But that is not necessary and slower ! D.J.Peters wrote: With other words what you are doing or what is the source of your blabla text without delimiters ? I am just using Badidea's string doubled up a few times to give it some teeth. I suppose the project idea is to count the number of each of the keywords in some .bas file. I'll try a speed test on 32 bit Linux tomorrow, I think Badidea is a Linux user. dodicat wrote: I suppose the project idea is to count the number of each of the keywords in some .bas file. Sure but you have to parse the *.bas or *.bi files and split it in tokens. FreeBASIC isn't case sensitive "PRINT" "print" "Print" "pRiNt" and "?" are the same. If he split it in tokens my posted CRC32 string compare are a really fast solution. Last edited by D.J.Peters on Jan 05, 2019 4:24, edited 1 time in total. It is for the game I am working on. 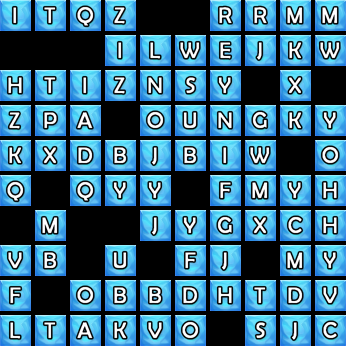 It uses a 2d block grid with letters (characters) on it. the player needs to move the blocks around to create words (freebasic keywords). I will use caps only. I should use a letter distribution function (https://en.wikipedia.org/wiki/Letter_frequency) or it will be difficult. "Atan2", "va_arg", "va_first" and "va_next" are a bit annoying. I hope no one will miss them. Last edited by badidea on Jan 05, 2019 12:44, edited 1 time in total. D.J.Peters wrote: FreeBASIC isn't case sensitive "PRINT" "print" "Print" "pRiNt" and "?" are the same. You suggest hashing, right? Could indeed be much faster. It does not need to be super-fast. My own version (with instr) is probably sufficient, not sure yet.